Four-color process printed on Side 1 of 80lb C2S White Gloss Text stock coated with Aqueous Gloss. 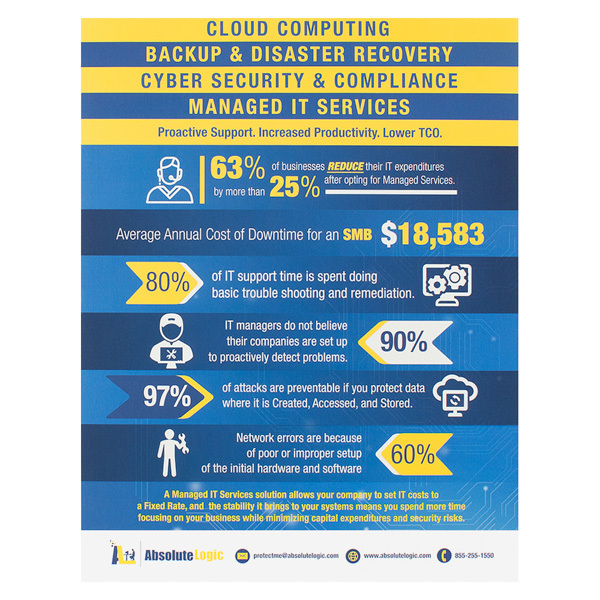 These stepped inserts for Absolute Logic all use a blue, yellow and white color scheme to match the company's brand. 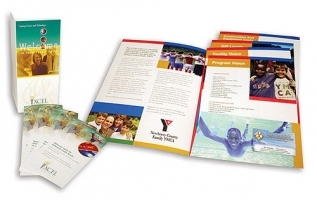 Each insert features different information regarding networks and information technology. A modern sans serif font makes the text appear professional and easy to read. Four-color process printed on both sides of 80lb C2S White Gloss Text stock. Coated with Aqueous Gloss. 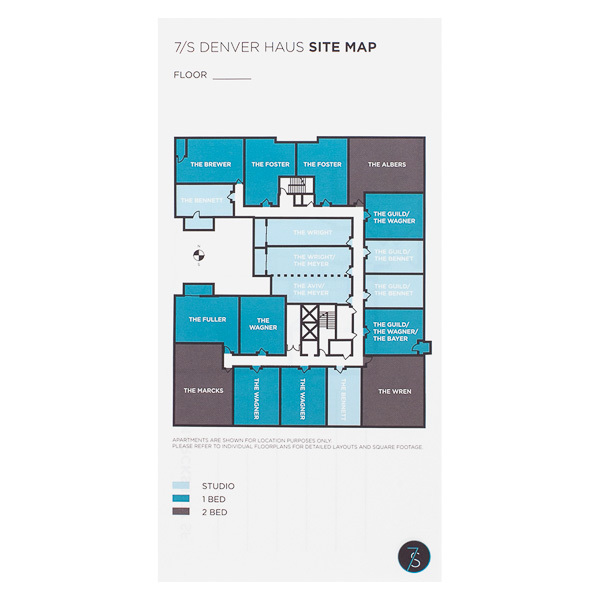 Prospective renters at 7/S Denver Haus can get familiar with their new home using this site map. It features the apartment’s layout, color-coded by number of bedrooms, and can be customized depending on which floor of the building they prefer. The flip side of each card showcases floor plans for one of the apartment’s thirteen units; here, renters can see the 2-bedroom Marcks unit. Blue and gray color branding adds a soothing, modern tone to the design that suggests 7/S will be a fun, trendy living space. Four-color process printed on Side 1 of 80lb C2S Gloss Text stock. Coated with Aqueous Gloss. Light, summertime colors cheer seniors and highlight the benefits of living at Cahokia Nursing & Rehabilitation Center. The green, yellow, and orange borders match the landscaped flowers in the photo imprinted on each page. Columns of text with wide margins and large letters are easy for aging eyes to read. Each insert details a different aspect of life at Cahokia, from its amenities and location to its admissions procedures and health services. Brand Services sets these stepped inserts ablaze with a brilliant orange backdrop and black accents that resemble billowing smoke. Photos showcase some of the fire protection and safety service provider's most popular products, with text below the photos describing each item at length. 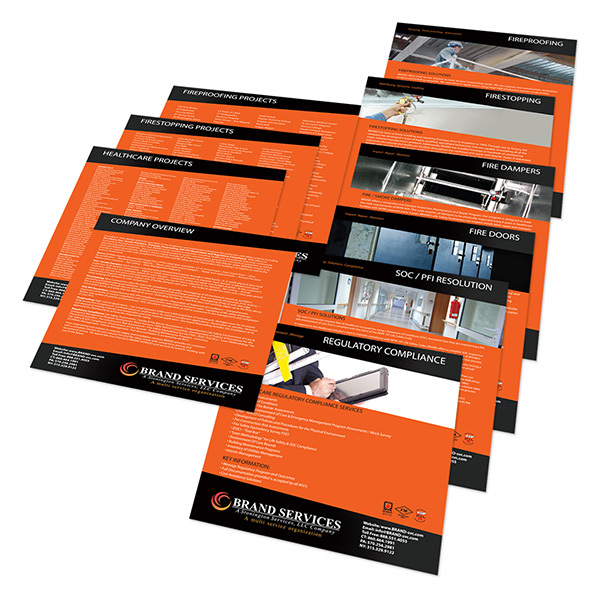 Other inserts contain a company overview and project lists, letting customers choose between in-depth product information or a more general company history based on their own needs. 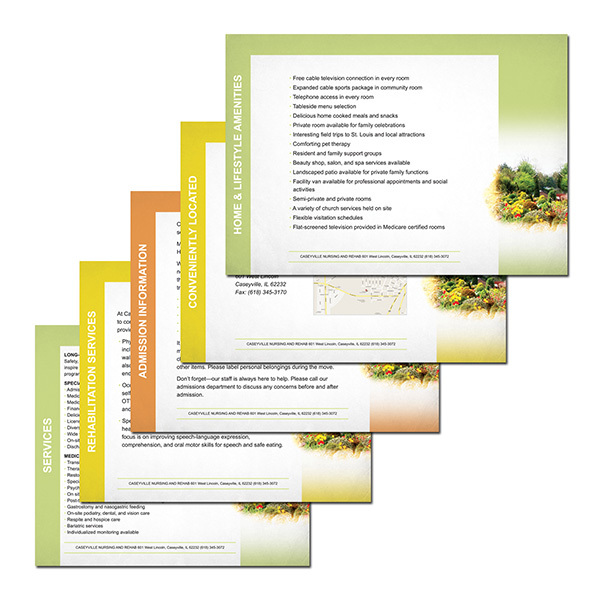 Stepped folder inserts display important information in an attractive stacked cascade, sized to fit large or small presentation folders.